Happily, these feminist writers are increasingly recognized across the academy for their groundbreaking achievements in understanding human-nonhuman relations. As an art historian, however, I find myself wondering why artistic production doesn’t play a more prominent role in these critical conversations. 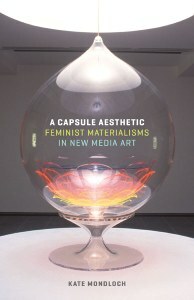 My new book, A Capsule Aesthetic: Feminist Materialisms in New Media Art, addresses this lacuna. I demonstrate how contemporary new media installation artists, like their feminist scholar peers, draw attention to our encounters with contemporary sciences, technologies, and other forms of matter, often in forceful and unexpected ways. Through case studies of new media installations by internationally renowned artists Pipilotti Rist, Patricia Piccinini, and Mariko Mori, the book argues that these artists share the animating ethical-political concerns of the scholarly feminist theoretical materialisms. Like their feminist scholar peers, Rist, Piccinini, and Mori explore the mechanisms by which bodies and matter become meaningful through technological interfaces. Artists may even go one better, at least by some reckonings, because they theorize not just with words, but in space, with technologies, and through bodies. While much scholarship devoted to the feminist materialisms stays exclusively within the realm of theory, artists such as Rist, Piccinini, and Mori are exceptional in that they literally stage and enact scientific and technological interfaces; and they do this in relation to the embodied phenomenal experience of human actors. Their works of art do not merely represent posthuman subjectivity. Instead, their installations present post-anthropocentric selfhood itself as an experiential site of critical contemplation. Their museum-based environments allow us to inhabit, contemplate, and feel new articulations of posthuman selfhood. While these specialized art practices may initially appear to be disconnected from everyday life, I propose an alternate interpretation. In addition to their deep connections to practices within the visual arts, these new media installations offer novel experiential environments for exploring, inhabiting, and even critiquing our entanglements with science and technology in the 21st century, and they pose interesting questions about human-nonhuman interfaces in the process. What are the particular conditions that allow this to happen? A brief overview of the genre of installation art is helpful here. Installations are participatory sculptural environments in which the viewer’s spatial and temporal experience with the exhibition space, and the various objects within it, forms part of the artwork. These works of art are always contingent upon the viewer’s embodied and contextualized experience; and they exhibit the entwined relationships between viewing subjects and material objects--this totally by design. In other words, the interface--where and how the viewing body encounters the material artwork--is in large part the meaning of the work of art itself. In the case of the installations explored in my book, the spectator’s experience of human-nonhuman interfaces, which I have deemed to be a feminist materialist project, is of primary importance. In the installations by Rist, Mori, and Piccinini, there is no conception of an artwork or environment “over there” and the viewer “over here:” their spectators experience themselves as contingent beings, constantly in process with other materials, bodies, and technologies. Rist’s immersive multimedia work, Pour Your Body Out (7354 Cubic Meters) (2008-9, Museum of Modern Art, New York), is a great example. (Selected video documentation of this and the other works in question is available through the book’s multimedia companion project.) The all-encompassing, cathedral-scaled work consists of enormous moving images projected onto all four walls of a colorful, carpeted, and cushioned interior. Immense cascades of magenta drapery partially enclose the otherwise sprawling exhibition space. Huge projectors emit dream-like, non-narrative imagery of female, animal, and natural forms. Upon entering the environment, viewers are free to choose how to explore it: some roam throughout the eroticized multimedia space, circulating amidst the other visitors, others sprawl in groups on a massive mattress-like seating element in the center of the space. Regardless of which path they choose to follow or the perspective from which they view the piece, Rist’s viewers find themselves surrounded by other viewing bodies, encircled by wall-sized projections, and enveloped by hallucinatory electronic music. There is no getting out of the entangled stickiness of it all--you feel your surroundings in this immersive multimedia environment. You are provoked, no matter how briefly, to experience yourself as embodied, sensuous, and contingent--as an active body co-constituted with other lively bodies, technologies, and processes. The book’s title, “A Capsule Aesthetic,” was inspired by the figurative and metaphorical use of capsules I discern in Rist, Piccinini, and Mori’s work. The term “capsule” is evocative because it implies something somewhat discrete yet also porous and mutable. (One might think of a gelatin pill or a soap bubble). On the most basic level, Rist, Piccinini, and Mori use a preponderance of capsule, bubble, and pod forms in their installations. The capsule metaphor also suggestively captures the model of post-anthropocentric subjectivity instantiated in their work. Their investigations of human-nonhuman interfaces offer a conception of subjectivity itself as “capsuled”—as contextualized, embodied, and located; contingent upon and constantly in process with the rest of the phenomenal world. The implications of this post-dualist model of subjectivity extend far beyond the art museum walls. (Indeed, feminist science studies scholars have articulated concepts suggestively similar to what I am calling a capsule aesthetic, although without explicit investment in the institutional context of the visual arts; see, among others, Barad on “intra-activity”, Alaimo on “trans-corporeality”, and Nancy Tuana on “viscous porosity”.) At their best, these artistic enactments of post-anthropocentric subjecthood allow us insights into our relationships with nonhuman technologies and forms that define contemporary life. As feminist materialisms in their own right, the artworks explored in my book serve as novel and previously un-recognized sites for theorizing subject– object relations befitting our twenty- first- century technoculture. Ultimately, my project unites two previously unrelated fields: it offers feminist materialisms as a productive lens through which we can better appreciate the critical contributions of new media art; and it establishes how appreciating artistic production can augment contemporary materialist theorizing. I hope the book will serve as an invitation for these fields to work together, provoke each other, and even begin to unite in the interest of shared critical projects.